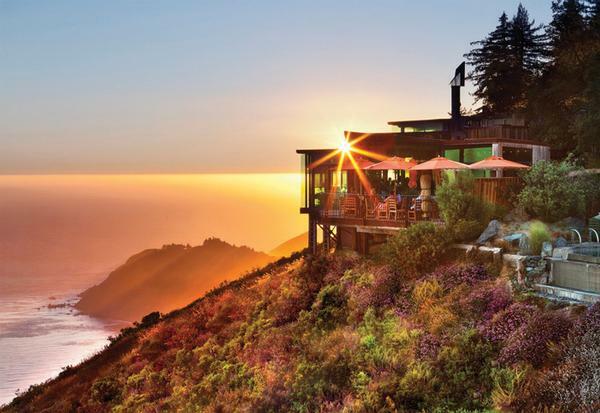 High atop the cliffs of Big Sur, 1200 feet above the Pacific Ocean, sits Post Ranch Inn, a sanctuary for the soul. Ideal for romance, relaxation or rejuvenation, Post Ranch is the ultimate destination for a luxurious escape. With natural architecture embracing the coast’s dramatic beauty, the 39 rooms blend rustic elegance, comfort and privacy with panoramic ocean or mountain views. Each offers a king-size bed, indoor spa tub, wood-burning fireplace, mini-bar with complimentary snacks and beverages, and private deck – many with an outdoor hot tub. The Wine Spectator Grand Award-winning Sierra Mar restaurant offers exquisite dining with a menu that changes daily, complimentary gourmet breakfast buffet and a spectacular setting with endless ocean views. Complementing the food is one of the largest wine lists in California. The award-winning spa offers an inviting array of services, including massages, facials, body treatments, rituals, shamanic sessions and more. Complimentary amenities and activities include gourmet breakfast buffet, valet parking, swimming pool, two cliff-top basking pools, yoga, fitness room, guided nature walks, stargazing, and hiking on the historic ranch’s 100 acres. Nearby, Big Sur offers state parks, beaches, art galleries and more. Picturesque Monterey and Carmel are within an hour’s drive. Adults only, please. A Preferred Boutique Hotel. These oceanfront rooms are unique in design and comfort. Located in a single structure they are recessed into the side of the mountain and feature sod roofs with a soft carpet of grass and wildflowers. They offer panoramic ocean views from the bed, bath, window seat and terrace. The two-sided fireplace can be enjoyed from the bed and bath. Rates are per room, per night, including a gourmet breakfast buffet in Sierra Mar, valet parking, and daily guest activities/amenities such as yoga, swimming & basking pools, fitness room, hiking and guided nature walks. 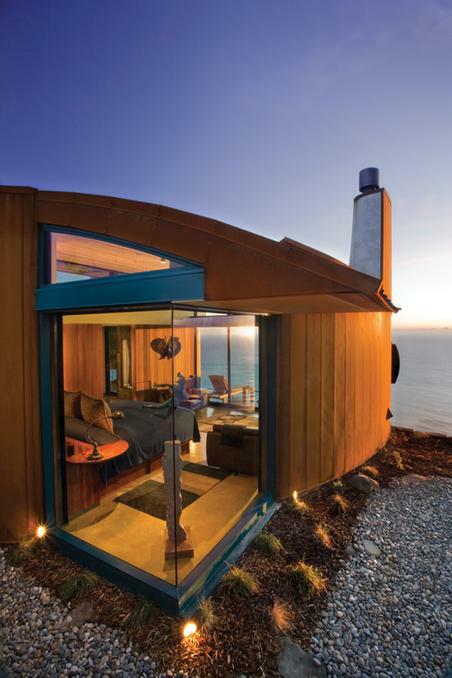 The circular design of the Coast House is inspired by nearby redwood trees. Each guest room in the two-story duplexes has a separate entrance, soft leather couch and coffee table in front of a cozy fireplace. 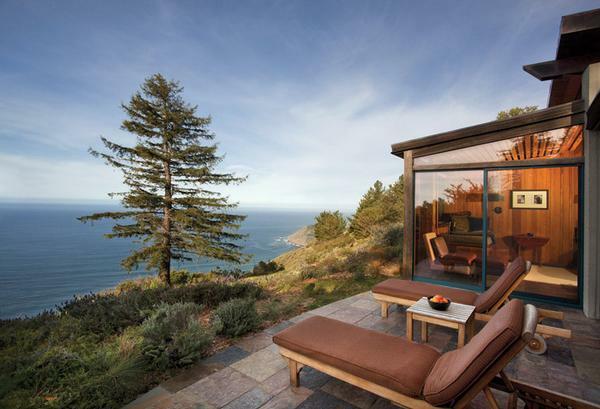 Partial or full views of the ocean and Big Sur coast can be savored from the bed, couch, tub and terrace. 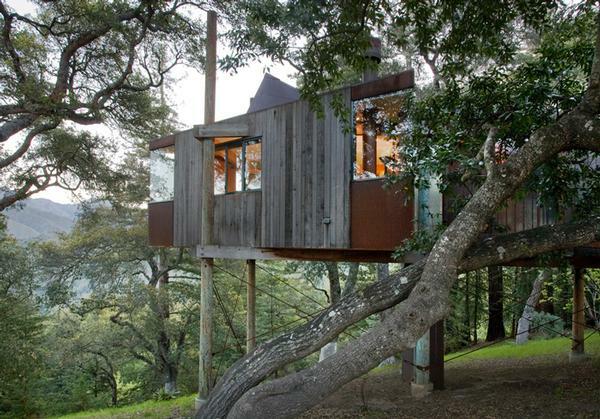 Some of the most popular rooms are the Tree Houses that are single structures built on stilts nine feet off the forest floor with a stairway to each entrance. Triangular in shape, each room has a king bed, sky light, window seat, desk and wood-burning fireplace Tree Houses have beautiful views of the trees and mountains to enjoy from the windows and terrace. 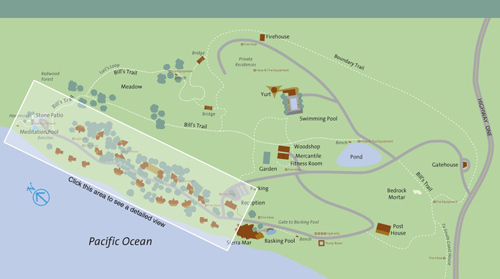 There are only two of these rooms at the resort and they are similar in design of the Tree House rooms but offer the interior circular design of the Coast House rooms. They are inspired by the nearby redwood trees. These two-story duplexes have separate entrances, and a leather couch and coffee table in front of the wood-burning fireplace. The Mountain House offers views of the Ventana Peaks and Mountains from the bed, couch, tub and private deck. The dramatic six-room building is shaped like a butterfly with outstretched wings. Under each wing are three floors, each with a private guest room and separate entrance. 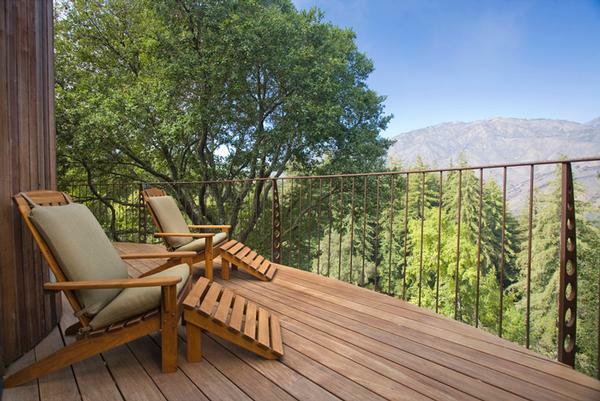 All rooms feature a spectacular view of the trees and mountains from a private deck. 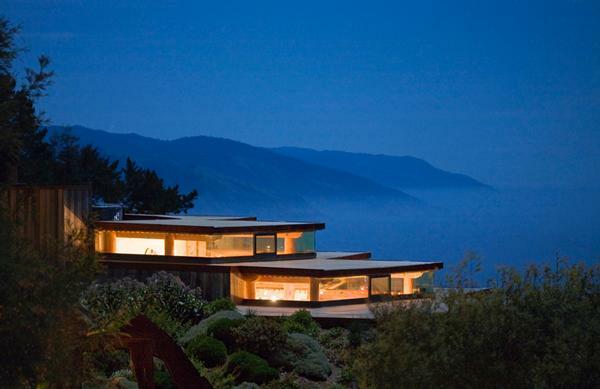 Cliff House - with ocean views Post Ranch’s ultimate accommodations. 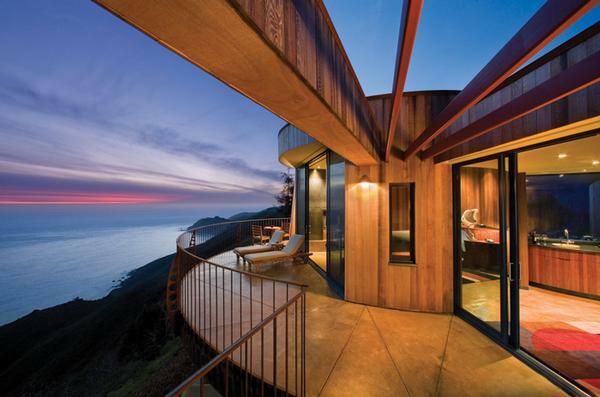 With a deck suspended over the cliffs of Big Sur, this extraordinary structure seems to soar. Enter through an enclosed garden courtyard into 960 square feet of luxurious space. The secluded, glass-walled bedroom features custom-built furniture, a wood- burning fireplace and radiant-heat floors. Soak in magnificent views of the Pacific Ocean – indoors from the large bathtub and shower, Located on the deck is the infinity basking tub. The curved interior opens onto panoramic ocean views to be enjoyed from four areas – the living room, the glass wall in the bedroom, the window by the oversized bathtub and shower, and expansive deck. The circular two-story building features two suites with an upper and lower room. Each offers 960 square feet, with private entrance, custom-built furniture, wood-burning fireplace and radiant-heat floors. Both rooms feature a deck private stainless steel hot tub. The spacious ground-level guestroom with curved interior opens onto expansive ocean views to be enjoyed from four areas – the living room, the glass wall in the bedroom, the window by the oversized bathtub and shower, and spacious terrace. The circular two-story building features two suites with a king-size bed facing the ocean. Each offers 960 square feet, with private entrance, custom-built furniture, wood-burning fireplace and radiant-heat floors, and a private stainless steel outdoor soaking tub. 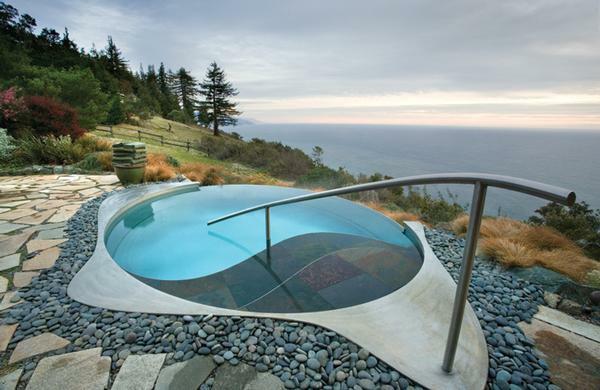 Peak House/deck basking tub.Spectacular mountain views. This room is the same floor plan as the Cliff House rooms but with incredible views of the San Lucia mountain range. The deck is deck suspended over the top of the ridge, This 960-square-foot room showcases an unsurpassed and private mountain view. Enter through an enclosed garden courtyard into the secluded, glass-walled bedroom, featuring custom-built furniture, wood-burning fireplace and radiant- heat floors. Soak in the views – indoors from the large bathtub and shower, outdoors in the stainless steel hot tub overlooking the mountains. 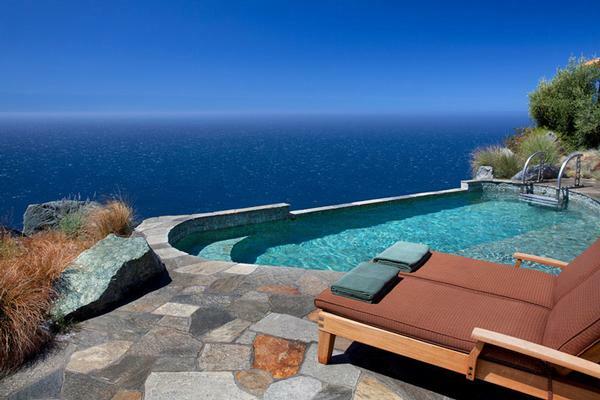 Within a short stroll to the hotels main Jade basking pool with ocean and coastal views. Take your pick and relax in either of the three pools at the Post Ranch Inn. The infinty jade pool is located next to the Sierra Mar restaurant overlooking the ocean. Kept at a constant 104 degrees, which offers a spectacular place to soak and take in the view. Located on the sunny knoll below the reception office, the heated lap pool is perfect for a refreshing swim or a relaxing poolside sunbath. Take your pick and relax in either of the three pools at the Post Ranch Inn: Our infinity meditation pool is located at the north end of the main path overlooking the ocean; also kept at a constant 104 degrees, this stainless steel infinity pool offers breath-taking views. Our spa treatments are designed to relax and revitalize using the healing properties of nature. Begin your journey with a soothing spa treatment, an invigorating private guided hike, taking in a unsurpassed view of the Ventana Double Cones, or an energizing yoga class. Breathe deeply, walk softly, let go - harmonize your body and soul. 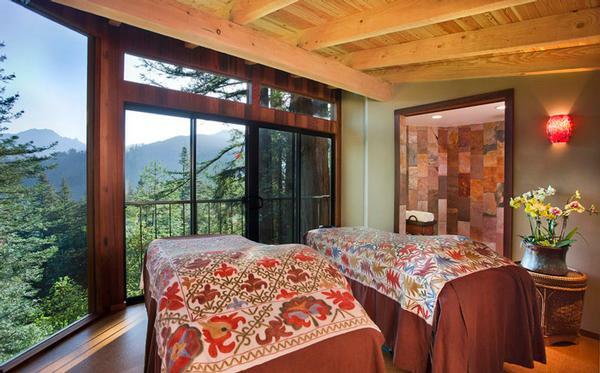 The treatment rooms are centrally located, nestled on the ridge top with Redwood trees framing inviting views of the Ventana granite peaks. This comforting setting offers relaxation in the heart of nature. Spa treatments can be enjoyed both in your room and the treatment rooms. Our Ventana Double Cones Spa Suite offers a private setting where redwoods frame inviting views of the Ventana Double Cones granite peaks. Featuring a wood-burning fireplace, hydrotherapy tub, outdoor deck and spacious interior, enjoy our signature spa treatments for singles or couples. 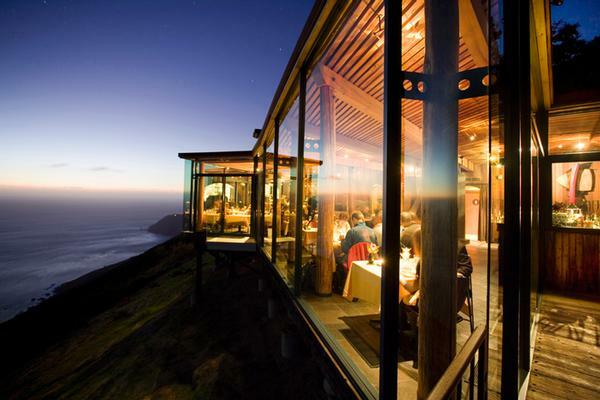 Overlooking the Pacific Ocean with a 180-degree view of the California coast, the award-winning Sierra Mar restaurant pairs world-class cuisine with an awe-inspiring setting. Led by Executive Chef Craig von Foerster, the Big Sur restaurant features innovative cuisine created from organic, seasonal ingredients. The four-course, prix-fixe menu changes daily. 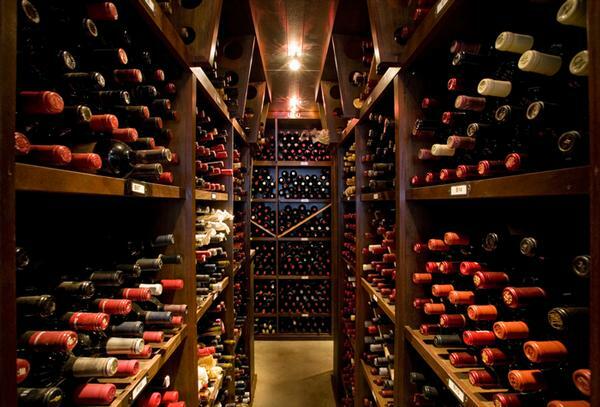 To complement the dining experience, Sierra Mar offers wine selections from one of North America’s most extensive cellars, which has garnered the Grand Award from Wine Spectator since the restaurant's inception. 8:00 a.m. – 10:30 a.m. Complimentary gourmet buffet breakfast, for inn guests only. 10:30 a.m. – 2 p.m. Picnic luncheon baskets available for inn guests only. Special take-out lunches may be purchased by the general public. 12:00 p.m. – 3:00 p.m. Lunch and light appetizers are open to the public as well as our extensive wine cellar and bar. Reservations requested. 3:00 p.m. – 5:30 p.m. Snack menu available to the public, including caviar and oysters, soup of the day, various salads with grilled chicken breasts, and a selection of artisan cheeses. 5:30 p.m. – 9 p.m. Dinner open to the public for the following reserved times: 5:30 p.m., 6:00 p.m., and 8:45 p.m., based on availability and subject to change. All other reservations are for inn guests only. Please note reservations are required. The four-course, prix fixe menu changes daily (à la carte option is available). Approximate driving time 2 to 2.5 hours.